Are you ready to Par-Tay?? Time for another Ta-Da Tuesday Link Party!!! What have ya'll been up to this week?? I can't wait to see! 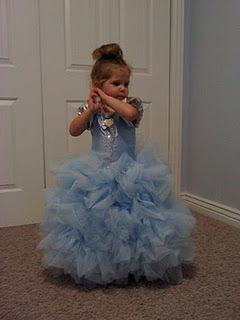 My good friend Rachel over at Family Ever After made this darling costume for her daughter! It is amazing- I hardly recognized the girl. So here is to another awesome party!!! 1. Become a follower of Mommy by day... Crafter by night and or like us on FB. 2. Link back to my blog, or put the Ta-Da Tuesday Button anywhere on your blog to share the link party love! Please remember to link to a specific post, and no links to giveaways or etsy shops. Thanks!!! I had a great time visiting my family in Utah! While I was gone, my blog hit some awesome milestones! Before I tell you what they are, let me start with a back story. Since DAY ONE my husband has been my #1 fan. He was the one to encourage me to make my blog and he has been SO supportive to me throughout this whole blogging journey. During the summer when I started out, he took both girls on countless daddy daughter dates so that I could get sewing and posting about it. And was always willing to have little "helpers" color homework so that I could work on a project. I guess what I am trying to say is that I am one lucky girl to have a hubby that is so supportive of me and encourages me to have time for myself and to live my dreams with this blog. Back in July (only one month after starting my blog) my husband made a prediction that I would hit 100,000 views by Halloween. I had a good laugh with that one- but he was dead serious. I can remember him telling me "Mark my words... it's gonna happen." Also while I was away, Mommy by day... Crafter by night hit 500 followers. You guys are the best!! I can't tell you how much I appreciate every comment, every follower, and every person that has helped inspire me to create things and blog about it. The list is endless, so I won't even try to name you all, but I hope you know how grateful I am for you all! Thank you so much ladies! You are amazing! So, to celebrate my milestones I have a big surprise for you all! Wondering what the surprise is??? Well you are going to have to wait a little longer to find out! leave ya wondering what in the heck they are going to say. Hello, Mommy by day...Crafter by night friends! My name is Summer from Seven Pretty and I'm super excited to be here today! I'm a stay at home mom who likes to stay up way too late making stuff. Most recently, I have been learning to sew, one project at a time, and have discovered that I love making clothes for my kiddos. I started my blog to document all my crafty pursuits and hopefully inspire others to learn to sew. Today, I'd like to share my festive fabric banner tutorial. Fabric banners make me happy. I love 'em. They make such fun birthday and party decorations and can be used over and over again. And since the banner is so...ahem...festive, I decided to make one for Halloween and I put together a tutorial while I was at it. To make my "festeggiamo" (translation: "celebrate" in italian) banner, I cut my rectangles from different fabric scraps and used 1/2 yard of unbleached muslin for the back. I love the look of muslin and if no one will really see the back of your banner, then it is probably the cheapest option. To get the most bang for your buck, you could make a double-sided banner and put a different phrase on each side. Or maybe a boy birthday color scheme on one side and a girl birthday color scheme on the other. There are so many options! The first thing I do is make my bias tape. What is bias tape? Dana has a very thorough tutorial telling you all about it and how to make it. Check it out! In a nutshell, double fold bias tape is a type of binding that can be used to finish off raw edges. It is cut from fabric at a 45 degree angle (called the bias) which allows it to have a little bit of stretch. The easiest option is definitely to buy it prepackaged. They have a fair number of solid colors available at Joanns or Hobby Lobby, and one package contains the exact length you need (3 yards). If you want your bias tape to be patterned (my fave), you are going to have to make your own. It's not hard, but it is time consuming. Again, read Dana's tutorial to learn how to make your own. * Notice how the stripes are at a 45 degree angle...that's what happens when you make bias tape from striped fabric. Pretty cool. Okay, you have your bias tape, now it is time to cut out your rectangles. Cut (1) 5.5 X 7.5 rectangle from your front fabric and (1) 5.5 X 7.5 rectangle from your back fabric for each letter in your phrase. *I also like to use a blank rectangle for the spaces in a phrase, but you could leave a blank space in your banner if you prefer. Once the front and back pieces are sewn together, your finished rectangle will be 5X7. The number of rectangles you need will depend on what you want to say. Now turn your fabric right side out and make sure to push out your corners all the way (using a chopstick or something similar helps). Time to prepare your letters. First, follow the package directions to adhere a 9X12 piece wonder under to your lettering fabric (that should give you enough space to cut out all of your letters). 1) If you are brave, you can free hand the letters. 2) Or, find a font you like on the computer (that has some substance to it), spell out your phrase, blow it up until the tallest letter is about 4 inches tall, and print. Then cut out the printed letters, and use them as a stencil to cut your letters from the fabric. **I really like Arial font (as seen on the "festeggiamo" banner). It is basic and looks really nice. I used a more playful font for the "trick or treat" banner. 3) Or, you can use a cutting machine, if you have one. I happen to have a Silhouette SD cutting machine (which I love), and it makes this step very simple. Next, iron the rectangles so they lie flat. If you are using different fabrics in your banner, lay them out so you know what order you want them to be in. Then, remove the paper backing from a letter and place it on the appropriate rectangle. I place mine 1.5 inches from the bottom of the rectangle and eyeball it to center it. Once it looks good, iron on the letter (per package directions). Almost done. You still with me? Next, use a pin to mark the center of your bias tape. Then begin placing your rectangles, beginning at that center point with the middle of your phrase and work your way out. **Bias tape is made so that one side of the fold is slightly wider than the other. You want the thinner side to be on the front of the banner. That way, when you sew close to the edge on the top, you will still be "catching" the other side of the bias tape on the back. 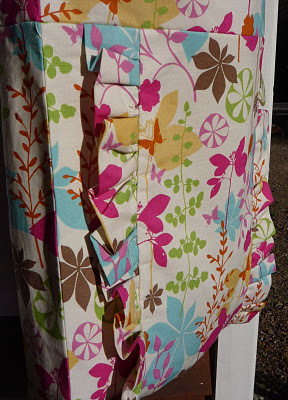 Once all of your rectangles are pinned in place, it is time to start sewing! Now go hang your new banner and admire your work! Thanks for having me Ashley!! And please stop by Seven Pretty for more sewing and craft inspiration. Hello Mommy by Day…Crafter by Night readers! I’m Erin, and I blog over at My Very Educated Mother*. I’m a homeschooling mother of three and when I'm not busy with my little scholars I like to spend my time creating, designing, and well, making things. My blog is a place for me to share stories, ideas, and inspirations and it’s such a joy to be able to share this tutorial with you! Everyone uses snack bags, whether it’s in lunch boxes, picnic baskets, diaper bags, or even purses. And while I try to do right by recycling and re-using my baggies I wanted another option. 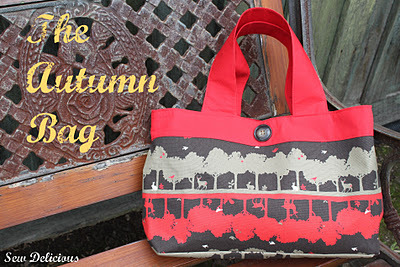 I could just buy re-usable bags but why when I can make them myself? Plus, the idea of crumb encrusted Velcro doesn’t sound appealing to me. The bag I came up with is reminiscent of the fold-top bags I had in my lunch box, circa 1984. They stitch up in a jiffy and in addition to being great snack bags, they make great treat bags for parties or gifts themselves. 1. Start off by sewing both pieces together along one of the 7” sides. Turn and press seam. 2. Fold the sewn edge down approximately 2”, and pin in place. 3. Now the unsewn edges are going to be folded up, 2 to 3” above that 2” fold, in opposite directions. The pictures explain this much better than I can. 4. Once everything is folded and lined up, pin in place and sew along the sides; leaving the top open. 5. Flip the bag right side out and sew shut the top opening. 6. There you have it! A fold-top snack bag that’s good for you and good for the Earth! *My Very Educated Mother is part of a mnemonic device I learned as a child to remember the planets in order from the sun. The complete statement went, My Very Educated Mother Just Served Us Nine Pizzas. Of course, since the whole Pluto fiasco, kids are left with Nothing...or maybe Noodles? Well, hello Mommy Crafters. I am Mallory from Split Ends and New Beginnings and Ashley asked me to guest post for her today. Ashley is sort of my blog mentor if you will. She is super encouraging when it comes to making my blog a better place for all things hair and beauty, but I just don't seem to have the blog skills that she possesses. With her guidance, I am sure I can find my inner blogger. I am just so happy that she asked me to guest post so I can work on said blogging skills. Let me tell you a little about myself. I have been doing hair now for over 10 years and I LOVE it. I think your hair is your BEST accessory. I say "accessory" and not a "feature" because you can change it and adjust it to your mood and to whatever look you want to show for that day. You can do so much with it and it can do so much for you. I feel my best when my hair has fresh color and cut. After having so many of my clients ask me how to do their hair in different and fun ways I decided to challenge myself by styling my hair different for 30 days. I got the idea from my good blog friend over at Hair Romance. It was such a fun challenge and it really helped to inspire both myself and many of my clientele. After finishing the challenge I decided to try and keep my blog going with the occasional hair and beauty tips and ideas. I think it is very important to look and feel your very best. Even in a pair of sweats and no makeup, we can still learn to appreciate the beauty that we possess inside (I sound like a Whitney Houston song.) Anyways, I am getting a little off track. I just want to share the love of all things girlie. I have a few video tutorials on my blog and I made one special for all of you who follow Ashley. I have to warn you, I am a little embarrassing. When you watch yourself doing your hair or looking at yourself in the mirror, it is totally awkward. I drop things, I repeat myself, my throat gets totally dry and I get a really itchy nose once the camera starts recording. At least I remembered to put the toilet seat down this time and I was able to edit out the two phone calls that I received. Oh, the joys of blogging! Enjoy! If you have any questions, let me know on my blog, and I will get back to you. Have a happy hair day! My patterns/tutorials/printables are for personal use only. Not to be used to make items for sale. Thanks so much!